In May of 2019, CLX will present Chicago’s first annual, festival for the future of learning and work! Imagine thousands of Chicago families exploring hands-on learning by tinkering with 3D printers, creating indoor vertical gardens from recycled 2-liter bottles, and broadcasting community solutions through podcasts. The world is changing. As it changes, our youth won’t just read about civic engagement, they will be restoring democracy. They won’t just be entering data, they will be inventing algorithms. 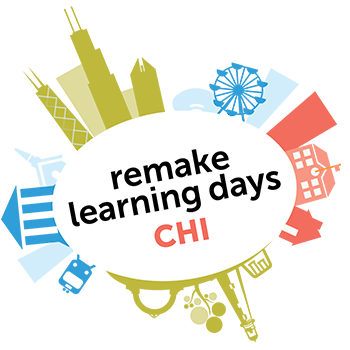 In May of 2019, the Chicago Learning Exchange (CLX) will turn imagination into reality by creating the city’s first annual future-ready learning festival entitled, Remake Learning Days Chi (RLD Chi). From May 16 - 19, CLX and founding partners—WTTW Chicago, Chicago STEM Pathways Cooperative, Chicago City of Learning and EvanSTEM—will turn our global city into an open and dynamic learning laboratory with more than 100 hands-on, learning opportunities in schools, museums, libraries, parks, and community centers across Chicago and neighboring Evanston. For more details, check out clx.fyi/RemakeDaysChi.